which had been hand written by a Mr A.S.A. Whelen about 140 years ago. A.Whelan was a second-class passenger aboard the iron clipper Hesperides that departed London on the 27th September 1878 sailing for Australia to arrive in Melbourne 93 days later on 28th December 1878. The account of the voyage is simply told. Short entries that recount the daily events that occupied their time for three months as they sailed from the temperate climes of England, across the stifling tropics of the equator to race along the roaring forties, where they came into close contact with an iceberg – to arrive in Melbourne having sailed totally by wind power half way across the world, to their new life. Their meals and lists of stock provisions. A list of the crew, and the farm animals taken to be slaughtered as required en route. Tales of card playing, taking tea with the ladies and what time he went to bed… every night! But interspersed with the daily mundanity of occupying oneself for 93 days in the confines of “our not too spacious bedroom (12ft x 6ft) to hold 3 by the bye (the Guv’nor, Arthur and myself)”, it’s a fascinating insight into travel at the end of the nineteenth century, where the only communication between vessels was via flags. I originally published the travel journal day by day on the exact same date they’d been written 140 years previous so as to allow the tale to unfold as it occurred. 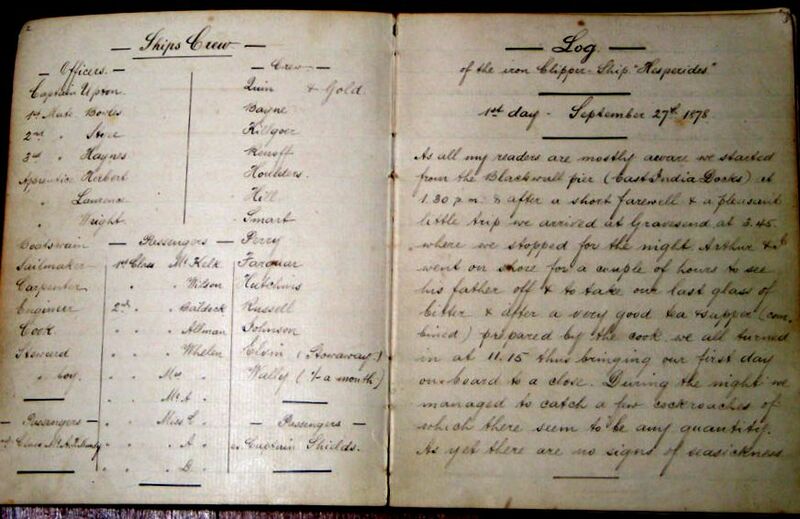 Travel Journal Entries from a Voyage to Australia 1878. It always astounds me that anyone made it out here. I have a number of convicts in my ancestry and what they had to endure for some really insignificant ‘crimes’ was amazing! Always amazes me how small the ships were and how large the journeys! When you tour a replica, you cannot imagine the conditions they lived and worked under. What a great discovery to live another persons life from the past. Wonder if our blog posts will intrigue anyone hundreds of years from now. What bothers me about the longevity of blogs is will the right platforms still exist to be able to access them? Its a bit like do you still have a tape recorder to hear back those huge reels of tape, or a little cassette player for those more miniature versions? Thanks for posting this. Very interesting to see what it was like to be a travel blogger 135 years ago. Also, the guy had amazing handwriting. Can anyone write like that now? Thanks for linking up.